John Corben walks in the darkness intent on reaching his destination. He thinks of how eighteen months earlier he was in a catatonic state. General Sam Lane suggests that instead of sending him to Walter Reed Hospital that they give John a "jolt" with a sample of Kryptonite. The first rush of Kryptonite was intense but that was short lived as after running a battery of physical and psychological tests Corben is declared unfit for duty. Between the damage to his psyche due to his injuries and previous instances of excessive force the Captain giving the report decides that she can't be responsible for turning him loose. The General overrules her and Corben is sent into the field. Things go pear shaped in a hurry and after killing a group of insurgents at the expense of civilian casualties the government tries to eliminate Corben but he manages to escape. He walks along the bottom of the ocean and finally reaches his target; General Sam Lane. Lane confronts Corben and tells the cyborg that Lane gave him every opportunity to succeed but Corben's actions led the top brass to order his execution and because General Lane is a good soldier he carried out those orders. Corben threatens Lane and his daughter but it turns out that Lane was just stalling for time and Metal-2.0, the next stage in super soldier evolution, arrives. The battle is brief and in the end Corben emerges as the victor. Metal-2.0 activates his self-destruct program and the two cyborgs are engulfed in a fiery explosion. General Lane has his men comb the wreckage to find Corben's remains. Corben, it turns out, was rescued by the Secret Society. The Scarecrow offers Corben a chance to join the Society and to put his talents to good use. Seeing that his old life is over Corben accepts. He doesn't see himself as John Corben or even Metal-Zero anymore. Now he is only Metallo. Story - 5: Ah Sholly Fisch... how I have missed you on this title. I am going to admit that going into this book I was pretty much against the whole Metal-Zero thing. Not the idea of a cyborg with a Kryptonite heart. That's a pretty nifty idea. No, I have come to the conclusion that Morrison going with Metal-Zero as a designation was a way to get around what could be seen as a silly name. You can still have Metal-0, which sort of looks like Metallo but now it has a more realistic ring to it. It reminds of Morrison's time with the X-Men when he revealed that Wolverine was not Weapon X but actually Weapon Ten. For a man that seems to thrive on out there ideas and concepts Morrison chooses weird times to want to be real about something. Through the course of this story Fisch fixed all of that. Now I could be totally misreading the situation and this could have been Morrison's idea all along but Fisch took a name that I didn't like and showed that it had its place in the character's backstory but in the end he was going to be plain old Metallo. As usual Fisch did this with a very character driven story that had bursts of action but a solid foundation which made this a meaty read. This wasn't a surprise as Fisch has always been a top notch writer and brought more to his stories than bizarre concepts or an endless succession of action scenes. Nothing against either of those ideas it is just I, as a reader, am more emotional and while sometimes I do like to read something without there ideas or is a huge slugfest most of the time I want to be engaged on an emotional level. Fisch made Corben a three dimensional character. I understood him by the end of the issue. I didn't like him, which I suppose is a good thing because he is a few bricks shy of a load and a killer, but I had a grasp on why Corben was the way he was. The pacing of this issue was great as well. Fisch started with Corben on the bottom of the ocean, went back eighteen months and slowly brought us to the present. I felt like there was a passage of time even though it was only a handful of pages. To some extent the story was predictable but I don't look at that as a negative in this case. You knew that once Lane gave Corben the Kryptonite that things were going to go bad. You knew he was going to kill those hostages to get at the insurgents. You knew that once Metal-2.0 was revealed that Corben was going to kill him. Even though I could see these events coming Fisch made them entertaining and engaging enough that I didn't care. This was a strong way to finish out Villains Month in ACTION COMICS. I am very happy that all four of the issues we were given this month were not only satisfying reads but also served to give future creators a solid group of bad guys to choose from. Metallo. Zod. Lex Luthor. These are all iconic Superman villains and their new origins were fantastic. I would include the Cyborg Superman but he is currently more of a Supergirl villain, but time will tell on that one. After those three amazing stories it was nice that this final .1 issue didn't disappoint. Then again Sholly Fisch was involved, so I wasn't all that surprised. Art - 4: The art in this issue served the story well. This was a tech and military heavy issue and there was just enough detail to sell that without going overboard. I am not a huge fan of the armor that Metallo is currently wearing but that is not the fault of Steve Pugh. He played the hand he was dealt and made it look good in the process. I am just a fan of a sleeker look for Metallo and I know that eventually we'll be given that. There were a number of diverse settings in this story and Pugh didn't let us down. I especially liked his take on the Scarecrow at the end of the issue. The writing and the art came together especially well this time out and made this comic a more satisfying read. Cover Art - 3: This isn't a terrible cover but I am not a big fan of it either. The armor is especially bulky and while the 3D effect is neat I don't think it is enough to save the cover. 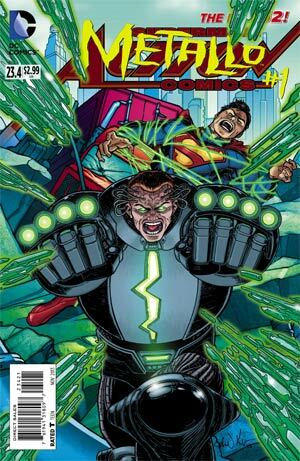 I also don't like that Superman is in the background while Metallo is firing towards the reader. It may look dynamic but I would rather see Metallo fighting with Superman instead of the audience.